The Department of Cardiology, Angiology and Pulmonology at the University Hospital Rechts der Isar Munich offers the full range of services in these medical fields. The department specializes in performing all kinds of cardiovascular interventions, modern diagnostics and comprehensive treatment of diseases of the arteries, veins and lymphatic vessels, all pathologies of the respiratory system. The doctors of the department prefer an individual approach, the use of modern therapeutic methods, which guarantee the optimal result. The department is headed by Prof. Dr. med. Karl-Ludwig Laugwitz. The department has an ultramodern Catheter Laboratory, within the framework of which more than 3,500 heart interventions are performed annually. The medical facility is of supraregional importance and is certified by the German Society of Cardiology, as well as plays a crucial role in the medical care of patients with acute coronary syndrome. Study of Medicine at the Witten-Herdecke University and at the Free University of Berlin. 1996 Training in Internal Medicine and Cardiology, University Hospital Rechts der Isar and German Heart Center Munich (Technical University of Munich). 2002 Habilitation in Medicine, Technical University of Munich. Heisenberg Scholarship of the German Research Foundation at the Institute of Molecular Medicine, University of California, San Diego, La Jolla, USA. 2005 Education at the Harvard Medical School. 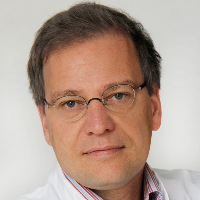 The main clinical focus of Prof. Laugwitz is the biology of stem cells, especially the self-renewal, differentiation and specialization of the cell lines of native progenitor cells during embryonic development, as well as the characteristic of the regenerative potential of embryonic stem cells from the line of cardiovascular progenitor cells.